My breathing is ragged and uneven I grit my teeth and pace the floor. I know I was right and I know he is wrong. Very wrong. It’s so obvious, and yet he wants to be right and tells me so. He sits in the bedroom. I am angry and can’t concentrate on my task at hand. I want to write but I can’t I’m mentally worn out. To me, it seems he doesn’t care. Does this seem familiar to you? 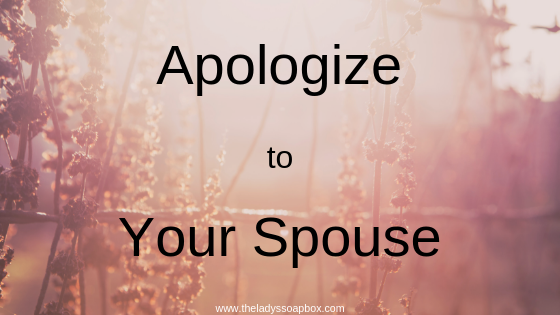 Do you find it heard to apologize to your spouse when your right? So often in marriage, it is easy to blame the other person. It’s so easy to sit on our high horse and and pat ourselves on the back. When we are right and know it. It is hard to see how or why we should apologize. After all it is up to the one who was wrong to show repentance. Right? You do what you have to do to give people closure; it makes them feel better and it doesn’t cost you much to do it. I’d rather apologize for something I didn’t really care about and leave someone on Earth wishing me well. Unwittingly did or said something that may have hurt the other person. This can be difficult to understand why your spouse may feel hurt or belittled. However, maybe it was the way you said something or your body language that may have caused hurt feelings. We all have life experiences that dictate how we interpret what is going on around us. This means you may not have intended something in a bad way but your spouse doesn’t read minds and therefore doesn’t know you didn’t mean to be hurtful. Knew you were right and was therefore purposefully harsher than necessary to prove it. Often we say hurtful things in our desire to prove our point to our spouse. And you can justify it because you are right and they will see it is all for a good cause. I have on occasion called my husband dumb because he can’t see what is plainly obvious to me. Usually the moment the words come out of my mouth I realize it is necessary to ask for forgiveness. But I try to tell myself he will forgive me if he can just see I am right. Devalued the other person. I spent a lot of time talking to people who seek an OK to have a divorce or even an affair. And the number one reason is, they feel devalued. They don’t receive validation for having the feelings they do have. This can come in a lot of ways, but failing to say you are number one in my life, and I don’t care about being right, will go a long way. For your Health. So out of curiosity for this article I decided find out if there is a medical reason for asking for forgiveness. Web md says by choosing to seek forgiveness we affect our anxiety, heart rate and blood pressure. A hard Heart. You can justify your reasons for not seeking forgiveness and apologize to your spouse. But it leads to a hard heart. A heart that never hears when your mate and partner in life is crying out for your understanding or acceptance. I would never want to be guilty of ignoring someone else’s pain. Apologizing to your spouse can make your problems easier to over come like i talk about in the insurmountable problem with marriage. Time will prove you’re the victor. If the 6 other reasons I stated previously were not good enough, then this one will certainly do nothing for you. However, if the others were nice, and you intend to apologize, but having one more might not hurt then, why not let time be the judge. So often I or my husband will say to one another “So that is what you were talking about? Now I understand, you were right.” (or something to that effect). It might not be right away, but just knowing that you finally got your victory. It did not take a war which is nice, right? Most married couples fight about money. Check out the Ultimate Bundles Master Your Money Super Bundle. Give yourself one less thing to fight about and one less thing to apologize for. Fighting also causes a great deal of stress. This month is stress awareness month find out what you can do to eliminate stress. Click the link below and tell me if this has helped you. The real art of marrage is forgivness. Have you ever fought with your spouse and apologized even when you were right. Did the apology help? Were you happy that you chose to apologize? I would love to hear your stories. Choosing to Talk or spend time with someone other than your spouse will only add to the discontentment you are currently feeling in your marriage.